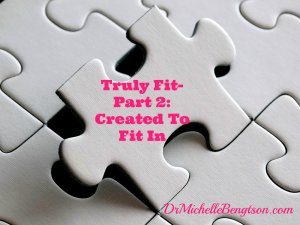 In my last post (Truly Fit-Part 1: Created To Stand Out), we talked about the fact that at different times and in different situations in our lives, we may feel as if we don’t fit it. We began the discussion about how God made us both to 1) not fit in, and 2) to fit perfectly, both at the same time. In my last post we discussed how Jesus didn’t fit in, and how we are called not to fit in but stand out, just as Jesus did, as light and salt of the earth. We are called not to fit in but stand out, just as Jesus did, as light and salt of the earth. The other side of the equation, however, reveals the paradox. God created each of us to truly fit. Scripture explains that we were fearfully and wonderfully made in the image of God, who is perfect. He designed each of us perfectly, and knew us before we were in our mother’s womb. Not only were we physically created to truly fit, but we were created to truly fit into God’s plan. We were physically created to truly fit, and we were created to truly fit into God’s plan. God promises in His Word that nothing can stop the will of God. “For the LORD Almighty has purposed, and who can thwart him? His hand is stretched out, and who can turn it back?” (Isaiah 14:27 NIV). He also promises that no weapon formed against us shall prosper (Isaiah 54:17). Furthermore, God works ALL things together for good for those who love Him and have been called according to His purpose (Romans 8:28). This means that no matter what we do, we truly fit into His plan. So as you look around you, perhaps dismayed at where you feel like you don’t truly fit, take comfort in knowing you truly fit in the only place that matters: right in the center of God’s will. How has God shown you how you fit into His plan? This is beautiful! We did a first fruits offering and covenant wave ceremony at church recently. I went through my Bible and wrote out all the scriptures that I had underlined in the Bible I’ve been carrying since middle school, where God has made promises to me and reaffirmed them time and time again. He’s reminding me that He surely does have a plan and to trust Him to bring it to completion! Loving this series. 🙂 Found you THIS time on the Mom2Mom linkup. You get around, dontcha? LOL Have a blessed week! Dalynn, what a beautiful idea to underline His promises to refer back to! He DOES have a plan for you-and it is to prosper you and not to harm you, it is for a future and a HOPE! He IS trustworthy! Because of Him, #HopePrevails! I’m glad I came back for part two 🙂 It’s encouraging to know that we fit into God’s plan. I’m not really sure how I fit in to it but I have faith that He will reveal it to me, according to His timing (and not mine!). I’m glad you came back too. We each fit perfectly into His plan. But the good news is that you don’t have to know how you fit into it. Just do the next thing He shows you. He can see the entire picture, every puzzle piece, while we see just a few scattered pieces around us that may not make sense this side of Glory. But it’ll be a beautiful day when we see the Master’s completed design! Because of Him, Hope Prevails! Yep, one step at a time 🙂 It is comforting, albeit a little frustrating at times, to know that He sees the whole plan. Thank you for your kind and encouraging reply. Thanks Beth. Yes, we absolutely rest in the sovereignty of God – He is good, and He is FOR us. Because of Him, #HopePrevails! Love the reminder that we fit in always in the center of God’s will. Great encouragement! Visiting from Holley’s. Thanks Kristen. His design for us is perfect, Made in His image, to fit into His perfect plan. Blessings! You’re right Jamie. I think being in the center of His will breeds contentment. We need nothing more, and if we did, He would provide it. Blessings! Interesting to have those two aspects together – but so true. Something to earmark to talk to my teens about. Thanks. Great idea Belinda. If we can fully appreciate how God made us and why He did so that way, it saves many problems with self-esteem down the road! So glad we fit in- right into His arms. Thank you for linking up with Three Word Wednesday. He created us perfectly, Katie. And his loving arms are always available! So glad you stopped by! Blessings! Glad it encouraged you Tracey! The center of His will is exactly where He is waiting to meet you! Run to Him! Because of Him, Hope Prevails. Isn’t it amazing Amy, how God makes things so simple, yet so beyond our comprehension at the same time? What a mighty God we serve! Because of Him, Hope Prevails! Thank you for your post. I am a Christian and have been for many years. But I don’t have a clue how I fit into His plan. And it makes me very sad, even depressed. I’m constantly trying to pray, read God’s Word, fit in at church, etc. But I end up striving and checking off the “good girl” list and getting no where. I feel lost, stuck, and alone for over 3 1/2 years. At 54 years old, I never thought I’d be divorced (again), no home and no job. LC, thank you for your vulnerability in sharing your heart. You are in good company. Most people I know have felt the exact same way at some time in our Christian walk. Here’s what I know: God doesn’t want us to strive, to check off a box. He just wants us to believe, to trust, to rest in Him, knowing that He is sufficient for all our sins and all our needs. I often don’t know what His plan is, but I know I can trust that it is good, and that He is FOR me, even when it seems others are not. Praying you will feel an extra measure of His love, as He gently guides you along His plan. Because of Him, Hope Prevails! Thanks again, Dr B. You are a blessing. I am SO thrilled beyond words to hear this!!! Thank you for coming back and letting me know!! Love these words right here: “So as you look around you, perhaps dismayed at where you feel like you don’t truly fit, take comfort in knowing you truly fit in the only place that matters: right in the center of God’s will.” Amen! Thank you for sharing this at The Weekend Brew. Thanks Mary! I pray it touches someone right where they need a touch of Him most. Blessings, Friend! “Take comfort in knowing you truly fit in the only place that matters: right in the center of God’s will.” AMEN!! Such precious thoughts, dear Dr. Michelle. I always anticipate my visits to your website because I know I will be encouraged and often times refreshed. Thank you for sharing with Roses of Inspiration. Sweet Stephanie, your comments always bring encouragement to my writer’s heart! I’m so glad you come by to visit, and that you are encouraged when you come! Blessings Sweet One! Thank you Terri! So glad you came by. Blessings as you fit perfectly into His plan! Thanks for sharing with Small Victories Sunday Linkup. Pinning to our linkup board and hope you found some great posts to visit this week! God has shown me I fit by giving me very specific tasks to do and my equipping me exactly as necessary for those tasks. My biggest hang-up is getting distracted, which leads to getting overwhelmed. Kari, God does have very specific tasks for each of us to do, that only we can do as part of the body of Christ. When we are obedient to seek out what He has for us to do, and then follow-through, He equips us to do them, and to fit beautifully into His plan!! We all get distracted, so when that happens, go right back to Him for a course correct! He is faithful!! Because of Him, Hope Prevails!